IBM® CICS® Transaction Server (CICS TS) has been available in various guises for over 40 years, and continues to be one of the most widely used pieces of commercial software. 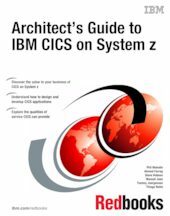 This IBM Redbooks® publication helps application architects discover the value of CICS Transaction Server to their business. This book can help architects understand the value and capabilities of CICS Transaction Server and the CICS tools portfolio. The book also provides detailed guidance on the leading practices for designing and integrating CICS applications within an enterprise, and the patterns and techniques you can use to create CICS systems that provide the qualities of service that your business requires.